Today in English 5 we discussed and explored, excavated and thoroughly meandered the idea of Truth, and how one knows when they really have a true Truth. How is it that we have this set of beliefs, versus some other? I offered that we only know Truths as we’re aware of certain falsehoods, either ideas we elect not accept or have somehow disproven. In my reliving of Plath’s works, letters, novel, and other pieces, I find that her prime Truth was language itself. Her tireless contributions to her journals and poetry collections, not forget the letters she wrote. Truth is what supplies us character, what gives us sight and understanding of ourselves and the world around us. Truth is more than belief, as we rely on Truths to motion us toward something beneficial for our story and character, our presence where we are, right now, is a result of truth. 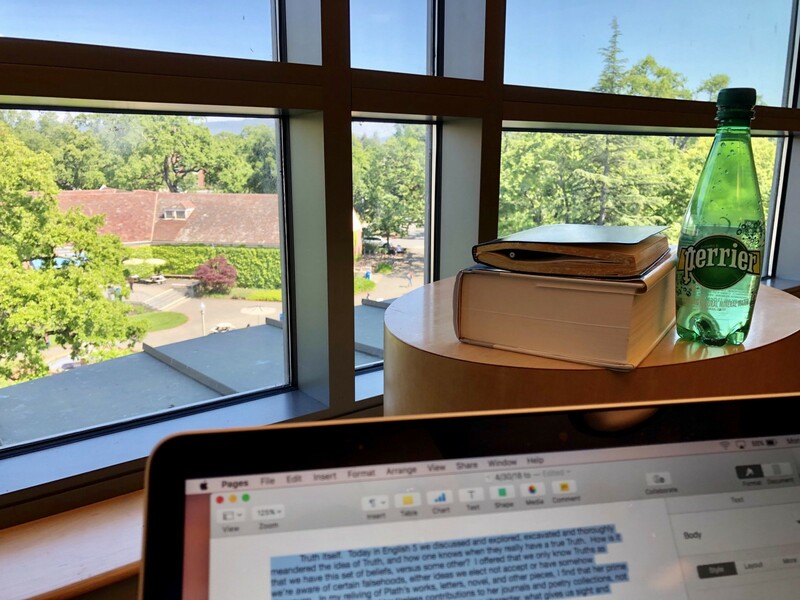 Me, now, writing these notes and others in the SRJC library, enacting my belief in thought, in student life, learning and education, the act of writing. This Truth coats me in composition and ease, happiness. I rely on this, me now a student in a library. Looking out the window and down at student walking from one building to another, to their car, to the cafeteria. This stage is my Truth, what I understand and upon what I depend for answers. Someone searching for Truth should be tested, feel at times exhausted and defeated, angry even. This is a de rigueur vie in Truth’s pursuit. What we find rewards us. Yes, there are minor truths, then ones so massive that our conceptions are irrevocably re-scribed. We see the world different and our steps on all surfaces. In our Advance Comp’ class, we have always had an urgency and unique energy in our exchanges, gifting us new knowledge, sight, soundness of idea. Today was no exception. Today, a Truth for me. That, this. This is my stage. The students are my priority, I guess you could interpret, but my reasoning epicenter. Why I’m here. What I’m here composing. Not that I compose their character, but I compose ideas to offer in response to the ideas they compose, write and type and print, bring to the Room. And, their compositions, what they compose and read from is a constant in the denotative and connotative constant of Truth. In itself, the idea of, we experience assurance, gratification that we brought ourselves to it. Beliefs, ideas, axioms and prominent principles stretch from its stretch. To find a Truth is to find more doors and Roads, opening to something else. If we stop, then there is no growth. But, if we keep with our explorations and need for explanation, more of It, the we grow as characters, in character, more characterized by what the character has encountered. Truth itself, something to believe in. Find one, you find others, you find more of you, where there’s more knowledge and sight to be imbued. Plath infers that the truth loves her. That’s only because she took the time to find it, so it loved her back.